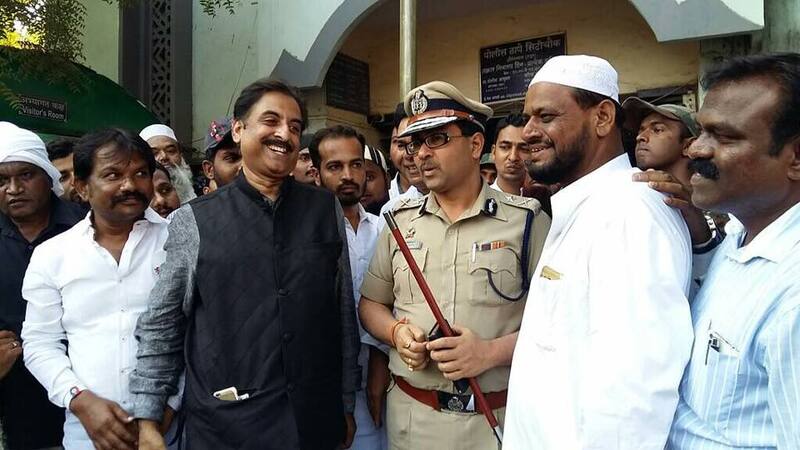 Aurangabad : Firebrand leader of All India Majlis E Ittehadul Muslimeen and sitting MLA of Maharashtra State Assembly Imtiaz Jaleel has demanded all the transactions related to sale/ lease/ resale related to Kondhwa Wakf land in Survey No 55 as illegal and demanded registration of criminal cases against the suspects for cheating the nation and its people. Jaleel in his letter to the Chief Minister stated that the entire portion of the wakf land situated in Survey No 55 was wakf land and meant for the poor and needy. While addressing mediapersons, Jaleel said that the those involved in the illegal sale of Wakf properties were doing anti national act by depriving the rightful beneficiaries through their corrupt, , malafide and shady actions. “ The CID probe will bring about the truth and the results will be out in public soon ,” he said. The MIM party too has petitioned the government saying that the trustees had illegally sold the community and national real estate to the thieves and must be sent to jail. The MIM party bearers have further requested the government to immediate arrest of the trustees under the relevant sections of the Indian Penal Code (IPC) and set up a dedicated fast track court and compulsorily jail the suspects so that justice is done to the poor and needy muslims. MIM office bearers and Wakf board activists privy to the case related to the prime wakf land of survey no 55 in Kondhwa said that the concerned Kondhwa wakf land was estimated to be worth Rs 500 crore would soon to be returned to the muslims by the state government citing that there was lot of anger and resentment against the corrupt trustees not only in Pune but across the state amongst the ordinary citizens of the state . Moreover, all the legal papers are in favour of the wakf board while the crimes committed by the trustees and their henchmen is also on record which will make sending them to jails an easy task , the activists alleged .The MIM officials have also demanded longer and harsher prison sentences post conviction for the culprits enagaged in the sale of wakf land. The culprits who have sold the wakf land cannot escape the law and will be handcuffed and sent to jail by the police and there is a hundred percent guarantee of that according to the constitution of India, MIM officials said. They also demanded the police to display the pictures of the culprit trustees in the rogues gallery of criminals to send a message to the society that nation was at the top of each and every countryman and the corrupt cannot cheat the government. Jaleel who has been christened as the liberator of Wakf lands by his supporters in Maharashtra, has been instrumental in taking legal possession of a 100 crore Wakf land at Kranti Chowk , has emerged to be a champion of national muslim wakf land cause whose words are given the highest respect by the state government led by Chief Minister Devendra Phadnavis, his supporters informed the media. The beneficiaries of shoddy Wakf land deals are likely to face trouble as the BJP led government is planning a major CID probe into such deals in past 15 years. Minister of state for social justice, Dilip Kamble has already made an announcement in the State that if needed the government shall even initiate even a CBI inquiry of Wakf land deals during last 15 years.In his reply, minister for minority affairs announced that the property of Wakf Board will not be allowed to transfer to a person or institute or organisation in future. Jaleel read out the speech of the then BJP MLAs Devendra Fadnavis and Ex Minister Eknath Khadse who on August 2, 2013 had raised the issue of Wakf land grab by ministers and MLAs from the Congress and the NCP. They both had demanded CBI probe into the multi-crore wakf land scam. Jaleel also informed the assembly about the statement of the then Congress chief minister Prithviraj Chavan who had assured the house of s CBI enquiry into the shoddy wakf land deals. Jaleel came down heavily on the Congress and NCP MLAs for speaking about the Wakf properties and their safeguard and protection. “ Let there be CBI enquiry and the truth will come out. The people will then know how sincere and clean your government was when it came to Wakf properties, he had challenged Congress and NCP members throwing the gauntlet at them. Land experts studing the shady and illegal deals of Kondhwa Wakf Land allege that the criminals involved in the deal used corrupt Talathis and land records officials details to falsify the records. However, all their nefarious deals have been caught on record and will be produced as solid evidence which cannot be denied by any legal authority in the country . Besides, MIM party officials in Pune maintained that computerized system of public land records in a digital era was the only fool proof system which can bring down corruption. MIM is also planning to shame the culprits involved in public and has also readied a legal dossier against them with the Pune Police,Maharashtra Government and Courts. The legal cell of MIM has completed the necessary documentation and the same has been submitted to the State Wakf Department and Chief Ministers Office (CMO).